Are you the specialised volunteer we need? In March this year Lars was in Awasi as a wheelchair specialist for our therapy project. He fixed six wheelchairs and shared much of his knowledge with the young and eager therapist Ewan. He also trained the supervisors at school the right position of the children in wheelchairs. We have noticed that the wheelchairs need regular maintenance. Unfortunately there is little time, a lack of the right tools and/or not enough knowledge. The pictures show that children are not always positioned in the right way in the right wheelchair. This needs knowledge, repetition and skills must be developed: if you have done things in a certain way for years it needs time to adjust. One example is the hip-belt: it needs to be tight but might seem uncomfortable. However, it prevents the child from sliding down which might cause pressure sores. What we are now looking for is a volunteer who will check the wheelchairs and adjust them where necessary. What the volunteer also needs to do is give instructions about posture and positioning. Also how to stand at the Kenyan standing tables is important. A schedule might be made in consultation with the supervisors. You will also be in regular contact with the local population. Are you an independent person who needs a challenge and are you a specialist in posture and positioning: we are looking for you! Problems with the competition: more and more clubs could not afford the costs and withdrew their team, which made the competition no longer viable. Young players wanted to be paid. Because they played at a fairly high level they wanted a salary, which is usual at other clubs. Unfortunately Amara Foundation, being rather small, cannot afford these costs. Of course we paid the competition fees, transport costs and a meal: you cannot play on an empty stomach. However, structurally paying the players is impossible. Fortunately the team has not stopped playing. They still do their training at Urusi, they will be happy with all the kits from St. Michielgestel and look forward to meeting Claus and André. The focus is now more on youngsters under 16. The two football clubs in St. Michielsgestel are going to merge which means there will be new club colours. RKVV St. Michielsgestel has donated most of their sports kits in the colour black/yellow. They will find their way to Kenya gradually. Urusi will be very happy with them because their club colours have been black/yellow since the first donation from SES Langenboom. In Boekel books were picked up at Read to Grow. They will be taken along in October and find a place in St. Clare Children’s Home. 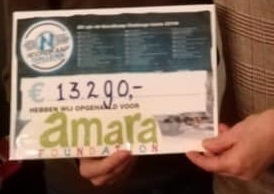 Also this year Jeanne d’Arc primary school has organised a sponsored run for Amara Foundation in Tilburg again. On September 12 Lisanne was at the school to tell about our foundation. The reactions of the children were heart-warming again. A week later Maria was handed over the proceeds: more than € 600! Thank you very much. On Sunday September 30 board member Evelien and her sister Irene were present at the multicultural market in the castle garden of Geldrop with a stall. We sold the products we had brought from Kenya. The ambience was great and Evelien could even say a few words on the stage. Everyone left very pleased, one woman in particular. She was very excited about a Kenyan picture she had bought. With a total of € 220 it was a very successful day. Supplier of washable nappies, Nappys.nl chooses a charity every year. In 2018 it is Amara Foundation. Every purchase generates an amount for our projects. Do you want to raise money for Amara? Do you like organising things? How nice it would be to organise something for a charity. Be present at a jumble sale. Organise a sponsored run, a benefit dinner or a Kenyan market. Or a garage sale of all the stuff you no longer need. Make jewellery or cards to sell for our projects. All your own and creative ideas are welcome! Of course we can provide you with folder material. We are looking forward to your reaction. From half October to half November Maria and Lisanne will visit all the projects in Kisumu where we will evaluate the projects and discuss progress. We are looking forward to meeting all our acquaintances: staff and children of St. Clare, Marvel and his little sister and parents, George and his welding business, the various mothers with their businesses thanks to micro credits, the milkman, board and players of Urusi, parents and therapists of the therapy centre, all the people that belong to the Amara family. The therapy project requires extra time this period: in October/November the new planning for 2019 will be made together with at least one of the board members, all parents of the therapy children and occupational therapist Samoo. We will look at the development of each child to assess what help is needed, what the parents can contribute and what Amara will pay. This financial plan will be laid down in writing so all parents know how much they will receive from Amara every month in 2019. This concerns therapy costs and possibly travelling expenses, medication, extra nutrition, appliances, school fees, transport to school and allowance for nappies. Of course lots of new cards and colourful trinkets will be brought along. This period two volunteers, Claus Foederer and André Cornelissen will be in Kisumu for ten days. They will tell something about themselves in this newsletter. During our stay in Kisumu we will try to keep you informed about our activities on Facebook. Greetings, Maria and Lisanne. Volunteers and trainer/coaches Claus and André go to Kisumu. In Kisumu we will concentrate on the sport project of Amara Foundation. We will support football club Urusi in the form of a course for the board and the coaches. Apart from that we will look into the possibility of introducing sport on a wider scale in the Urusi quarter. Apart from sport we want to find ways to generate subsidies or forms of sponsoring in order to realise a common space where various activities can take place for both the football club and residents of the quarter. Building such a space will be done in consultation with Amara Foundation. Here you can unsubscribe from his newsletter. Newsletter December 2018 Flying Dutzman reiken cheque uit.